The Safety-Slide™ features a compact, lightweight design that reduces user fatigue when compared to a traditional coupler design. 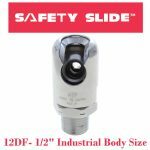 The Safety Slide™ eliminates the valve and spring often seen in traditional couplers, providing unrestricted flow and maximum tool performance. Connecting the Safety-Slide™ is accomplished under zero pressure by inserting the plug, and pivoting. All Safety-Slide™ Couplers are Chrome-Plated for easy clean-up in automotive or paint settings, and available in multiple sizes.